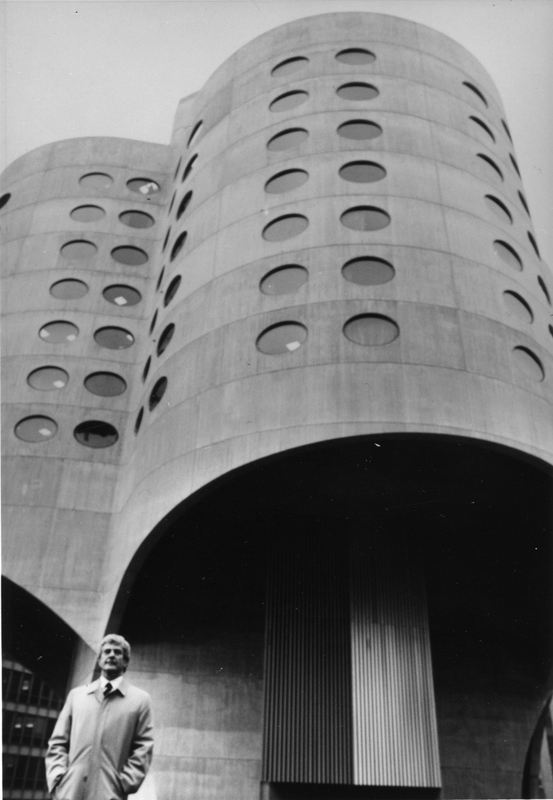 Prentice Women’s Hospital was designed by Chicago architect Bertrand Goldberg, whose distinctive and frequent use of curved concrete forms makes his work easy to recognize, but difficult to categorize. His interests and talents were wide-ranging, including architecture, engineering, urban design, industrial planning, furniture design, and writing. But it is only recently that his large body of work has started to receive the critical examination and recognition that it deserves, with a major retrospective at the Art Institute of Chicago in 2011-12. Goldberg is perhaps best known for his iconic Marina City towers (1963), which represented a startling new vision for urban living that integrated residential, commercial, office, retail and recreational uses in a “city within a city” prominently located along the Chicago River. But his early career was dominated by small residential projects and an interest in prefabricated and mobile structures, such as the Unicel freight car and the North Pole Mobile Ice Cream Store. This focus on technology as a means to put industry to work for social ends likely grew out of his early training at the Bauhaus in Dessau, but it is a theme that ran throughout his career. A detail of the intersecting cylindrical arches that made Prentice's unprecedented cantilever and column-free floors possible. Photo by BGA. Prentice Hospital showcases the complex combination of factors that contributed to the final form of Goldberg’s structures. Technical skill, engineering prowess, and technological innovations allowed for the creation of radical new forms like the lightweight, curved concrete shell and the cylindrical arches supporting the forty-eight foot cantilever of the tower. But these were developed in the service of the larger plan and a desire to create a highly efficient and effective community environment that promoted healing and provided the greatest benefit to both patients and staff. The groundbreaking achievements at Prentice guided much of Goldberg’s work on health care projects throughout the 1970s and 1980s. 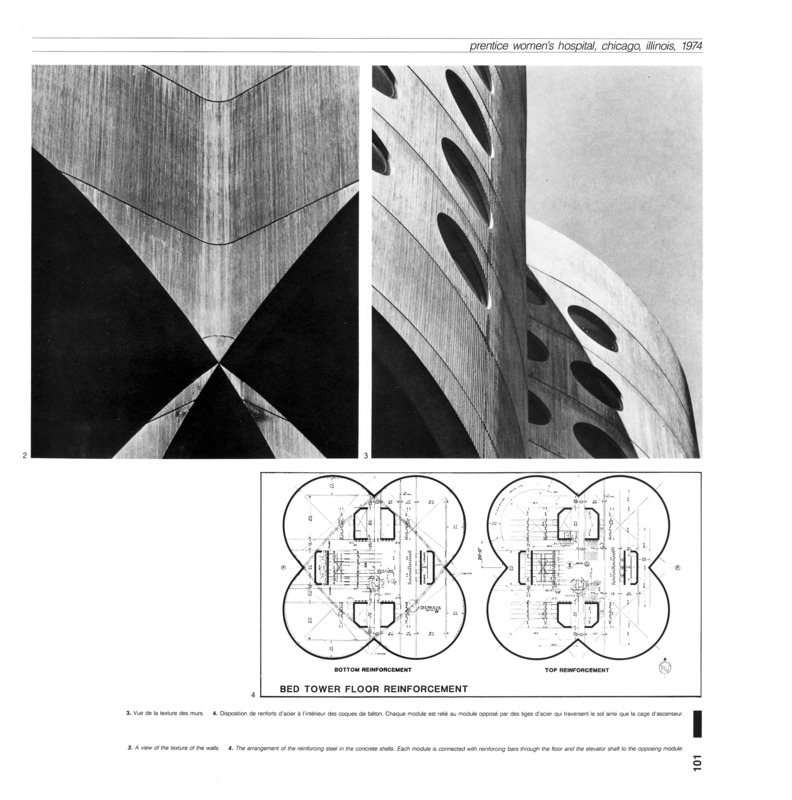 His unusual and innovative buildings were widely published and received international acclaim in the press at the time of their construction, including a 1975 award from Engineering News Record for the architectural and engineering accomplishment at Prentice. While many of his larger and more ambitious urban redevelopment projects did not come to fruition, or at least on the scale that he had hoped (River City), Goldberg remained a respected thinker, writer, and urban planner who explored new approaches to the revitalization of urban centers.